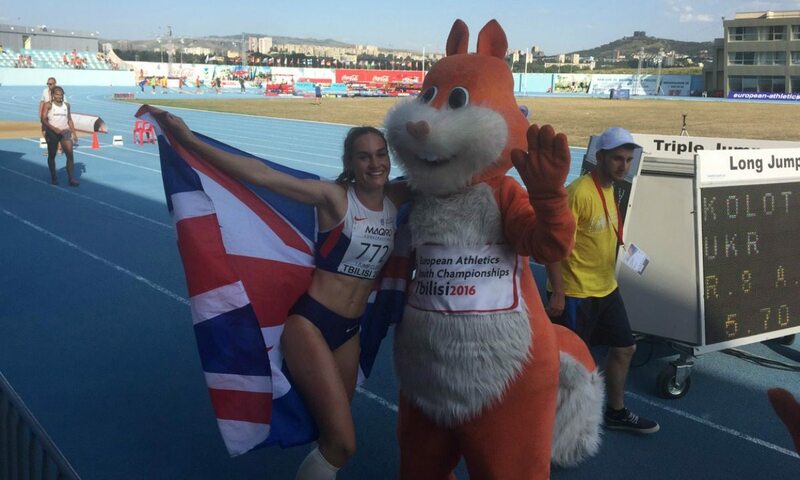 Victories by George Mills and Holly Mills helped the Great Britain and Northern Ireland team to a total of five gold medals and 13 medals overall at the end of the four-day European Youth Championships in Tbilisi, Georgia. Clocking a 1:48.92 PB on Sunday (July 17), George Mills won the 800m ahead of Italian pair Andrea Romani (1:49.58) and Simone Barontini (1:49.78), as Ireland’s Kevin McGrath ran 1:50.51 for fourth and Mills’ team-mate Markhim Lonsdale 1:51.10 for fifth. “I’m absolutely ecstatic,” said 800m winner Mills, who is the son of former England footballer Danny Mills. “I came in knowing I was capable of it if I ran well and recovered comfortably between the rounds. I ran the rounds maturely I think, easing off when I could but today was about getting out hard and making people work as hard as they could to beat me. Earlier on, Holly Mills had secured gold in the long jump despite battling against strong headwinds. Maja Bedrac matched Mills’ leading jump of 6.19m in the final round, but the Briton’s second best leap of 6.09m was two centimetres further than her rival’s so she claimed the title on countback. Britain’s Sabrina Sinha and Erin Wallace claimed silver and bronze respectively in a 1500m race won by 15-year-old Delia Sclabas, who completed a 1500m/3000m double in Tbilisi. The Swiss athlete clocked a 4:22.51 PB as Sinha clocked 4:23.10 and Wallace 4:28.17. Germany’s Manuel Wagner won the decathlon with a PB of 7382 points as Britain’s Sam Talbot placed 12th. After a strong day one of the competition which had seen Talbot sit second, the Briton opened day two with the fastest 110m hurdles time of 13.86, but three fouls in the discus put the British under-18 record-holder out of the reckoning. Talbot continued to run a PB of 4:46.45 in the 1500m. Martin Lamou won the triple jump with a 16.03m PB, as GB’s Jude Bright-Davies finished seventh with 14.78m after a PB of 15.40m in qualification, while Norway’s Arianne Duarte Morais threw a European youth best of 60.89m in the javelin and Emmanouil Karalis of Greece cleared 5.45m to win the pole vault before attempting a world youth best height of 5.56m. Belgium had two athletes on the podium in the 2000m steeplechase as Tim van de Velde got gold in 5:53.77 and Remi Schyns bronze in 5:55.06. Alessandro Sibilo won the boys’ 400m hurdles for Italy in a 51.46 PB as Britain’s Alex Knibbs ran a PB of 53.02 for seventh, while Viivi Lehikoinen won the girls’ race in 58.28. Maja Nilsson claimed the high jump title with her PB clearance of 1.82m, as Britain’s Ada’Ora Chigbo and Abby Ward cleared 1.75m to place joint fifth and seventh respectively. Georgios Koniarakis of Greece claiemd the discus title with a throw of 62.16m as GB’s James Tomlinson threw 57.10m for sixth. France won the girls’ medley relay in 2:08.48, while the boys’ event was won by Italy in 1:52.78.